Our water comes from the Florida Aquifer and it comes from the area known to be the purest for water quality. The first community water supply in the Hudson area was installed in 1923. It consisted of a hand pump well and 15 feet of pipe located east US Highway 19 off Hudson Area. The water was delivered by horse and wagon to all who ordered water at a price of twenty five cents a barrel. In 1956 Hudson developed its first water system which was started by 56 citizens of Hudson. The system consisted of a four-inch well pumping 60 gallons per minute, a 1,000-gallon pressure tank, and distribution lines. The effort was moved forward by the Hudson Community Club. In January of 1972, Hudson Water Works was formed and in January of 1974 Hudson Water Works purchased the Mountain Water Works. 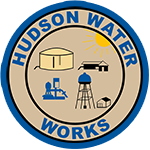 Hudson Water Works, Inc. is a non-profit utility with a seven (7) member Board of Directors that is elected in 4 year intervals. They are a direct line of communication for our members to the utilities. Their task also includes overseeing the expenditures and the future of Hudson Water Works. Our members are the owners of the utility company. There is a utility director that is in complete charge of the day to day operations and answers to the Board of Directors. Since 1956 Hudson Water Works has grown and improved the entire system since the original 56 customers to the 7,318 customers we serve today. Our water system is made up of A/C pipe, PVC pipe, and galvanized pipe ranging from 12″ inch to 1 1/2″ inch pipe. Our system is approximately 3 square miles. Above: Circa 1970. 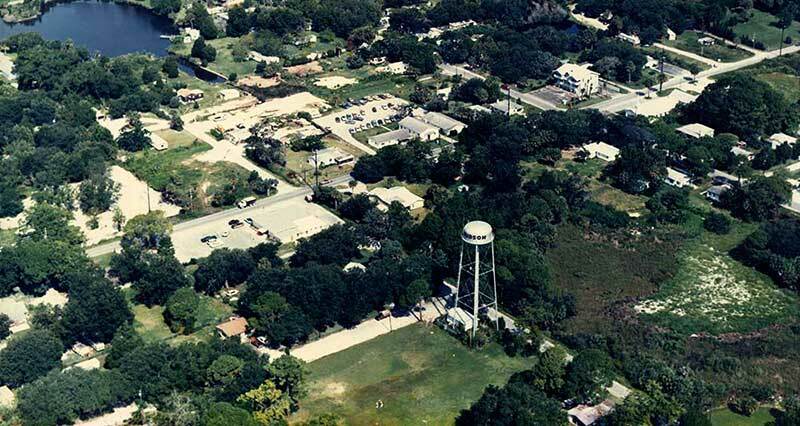 Our old water tower on Water Tower Dr. This location is now home to a state of the art pumping station. Hudson Water Works, Inc. is permitted through Southwest Florida Water Management District (S.W.F.W.M.D.) for twenty five (25) wells. All wells are active, water producing wells for public usage. The wells are located in four (4) well fields and alternate pumping daily to assure reduced chloride intrusion. The wells are between hundred (100) and one hundred and twenty (120) feet deep. Water Use Permit allowance for all well site locations combined is six hundred and ninety one thousand (691,000) GPD for the annual average quantity and nine hundred and eighty one thousand (981,000) GPD for the peak-month use quantity. Quantities are based on a per-capita rate of one hundred and eight (108) GPDC and a projected population of seven thousand three hundred and eighteen (7,318) in 2032. Hudson Water Works Inc. water service area extends from the northern area of US Highway 19 and Viva Villas subdivision to the southern US Highway 19 and Stahl Rd., from the Gulf of Mexico to the west and Little Rd. to the east. The area coverage of approximately three (3) square miles with some room for expansion. 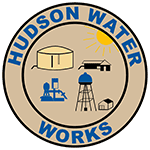 Currently Hudson Water Works, Inc. has two thousand six hundred seventy one (2,671) metered connections that serve an annual functional population of about seven thousand three hundred and eighteen (7,318). This number takes into account seasonal residents, tourists and other commuter population. Hudson Water Works, Inc. expects water consumer growth to continue to increase. Hudson’s water is pumped from the wells to a water treatment plant located at 8724 New York Ave. The water plant is monitored twenty four (24) hours a day, three hundred and sixty five (365) days a year. Chlorine is added at the water treatment plant and sent out to the water distribution system. There are two (2) above ground storage tanks, one (1) with the capacity of holding One (1) million gallons and one (1) with the capacity of holding a half ( ½) million gallons. After the water leaves the water treatment plant, eight (8) inch water lines feed a half (1/2) million gallon above ground storage tank as well as the distribution system. The re-pump station is utilized to maintain constant pressure in our distribution system in the City of Hudson. The re-pump station pumps the water during the day and fills at night.